Native Pup features unique dog collar designs to make your pup look beautiful! To accurately measure your dog's neck size, use a cloth measuring tape or string and measure around your dog's neck. We suggest adding 2 additional inches to your dog's neck size to find the perfect collar size. Please see the size chart in the pictures for more information. GET IN THE HALLOWEEN SPIRIT: Halloween only comes around once a year so why not let your pup in on the fun too! 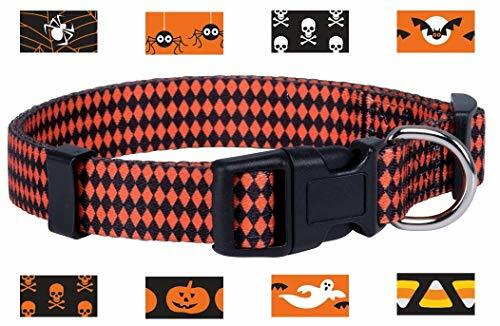 Choose from tons of different patterns of Halloween dog collars. DURABLE: These Halloween dog collars are made of durable polyester that's impossible to tear. Strong plastic clips reliably secure the collar around any dog's neck. Metal D-Rings provide a secure attachment point for your leash. VIBRANT COLORS: Each Halloween dog collar features vibrant black and orange Halloween colors. ADJUSTABLE SIZE FOR ANY DOG: From Shih Tzu to St. Bernard, we've got you covered. We have sizes from as small as 7 inches to as big as 26 inches. See the size chart in the pictures for optimal fitting for your dog. NO UGLY BRANDING: We don't want your dog to be our billboard so we put our branding on the packaging, not on the collar. If you have any questions about this product by Native Pup, contact us by completing and submitting the form below. If you are looking for a specif part number, please include it with your message.